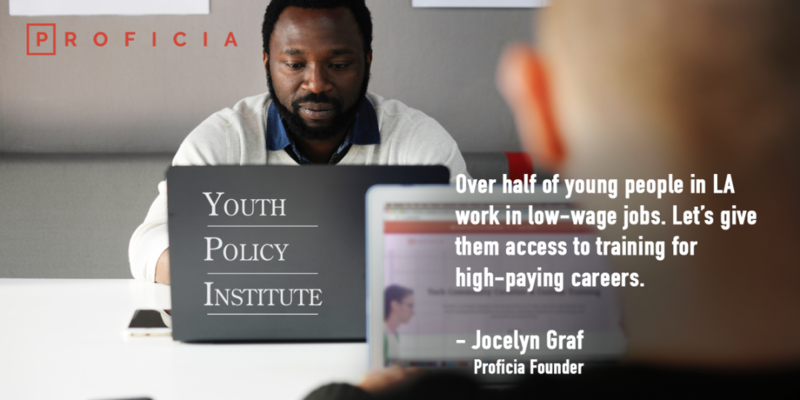 To draw on Proficia’s expertise in setting up technical workforce training, LA Cleantech Incubator (LACI) approached us to help build upon their partnership with the LA Youth Policy Institute (YPI). The goal was to provide YPI’s young people with opportunities to learn skills for immediate employment within the unique setting of the Advanced Prototyping Center and Training Center at the La Kretz Innovation Campus. At the same time, the program would converge with LACI’s diversity and inclusion priorities and enhance their workforce initiatives. Proficia started with a market study, interviewing prospective employers in government and private industry about skills shortages in Southern California. We identified a cluster of high-growth and high-demand mid-level careers–those that require more training than a high school diploma, but less than a four-year college degree. Employers reported that electronics technician jobs are paying as much as $35 per hour in the Los Angeles area and that skilled technicians are in short supply since many community college training programs in electronics have shut down over the years. Notably, hiring managers at Los Angeles Metro and the City of Los Angeles reported a need for electronics technicians. These large employers have a huge proportion of incumbent employees scheduled to retire in the next few years and they know that ensuring continuity of technical and institutional knowledge is critical to maintaining quality public services. Metro representatives also reported the need to help their contracting companies make local hires. Importantly, they specified an interest in considering qualified young people with barriers to employment. It’s a perfect fit for this innovative partnership! Based on what we learned from employers, Proficia team members Evan and Jocelyn then led a focus group of about a dozen YPI youth to report on where the jobs are and hear about the young people’s interests and career aspirations. From the beginning, we were impressed with the young people’s self-awareness and ability to articulate their goals. They were engaged in the conversation and asked thoughtful questions. We all came away with some uncertainty about how much their specific barriers to employment–from experience in the juvenile justice system to teen parenthood–might complicate their job searches. But we also came away with a sense of optimism about what they could accomplish with access to high-quality training in skills that employers want now. Afterwards, the three organizations met to flesh out an educational needs analysis. The YPI team was able to contribute insight from their firsthand experience working with the young people, while Proficia brought subject-matter expertise on the various options for training content plus an educator’s awareness of the literacy, numeracy, and computer skills needed for each option. LACI facilitated a discussion of how to best use the resources of the Advanced Prototyping Center labs. We considered the machine shop, with its CNC machines, 3D printers, and laser cutters, the wet lab, and the electronics lab. In the end, taking all these factors into account, we chose to focus our pilot training program on electronics and embedded programming because the materials are less expensive, safety is less of a concern, and we had the strongest connections to employers already established in this area. We envisioned an eight-week bootcamp: Electronics & Embedded Programming. YPI case managers and career counselors chose the most promising young people–those who had already completed a high school diploma or GED, or who showed talent in YPI educational and career programs. They invited about a dozen of them to the Open House at the Advanced Prototyping Center, hosted jointly by LACI and Proficia. The young people’s visit included a rundown of the Electronics & Embedded Programming bootcamp, a guest speaker who programs hardware for a living, and a set of electronics and computer logic activities in the Electronics Lab. The youth had a great time learning to read basic schematics and build simple circuits, and we were surprised to find that the favorite activity was solving a rather theoretical logic puzzle involving AND gates. Almost every young person who attended the Open House decided to apply to the program, and due to YPI’s rigorous vetting process, we found that all of the applicants were qualified to participate in the training. Within a couple of weeks, we were up and running with intensive classes 20 hours a week. The participants in the pilot cohort of the training program are off to a strong start under the able leadership of their technical trainer, Ricardo; pedagogical expert, Evan; volunteer assistant, Anthony; and a member of the YPI staff who rotates each day. We at Proficia are now reaching out to employers to introduce them to the job candidates coming out of the program. About half of the participants have changed their focus from going directly into the workforce and now want to go to community college. However, all of them want at least a part-time job. Proficia hosted an employer meet-and-greet with the trainees, and the event drew strong participation from potential employers among the portfolio companies participating in the Cleantech Incubator. Employers and members of the community who are interested in connecting these trainees to job opportunities can contact us at Proficia.